I love a clean, uncomplicated makeup look during the warmer months, but still like to keep things polished and with a little bit of pop. A bronzed, healthy complexion looks a treat with a bright red, tangerine or coral lip, and another great idea for night is to add a slick of black eyeliner. Think sharp not smoky to stay on the right side of modern, and pick a quality product that will stay the distance in high humidity after hours. One that I’ve been playing with lately and absolutely adore is L’Oréal Paris’ SuperLiner Gel Eyeliner (pictured), which is easy to use and gives a totally flawless result. 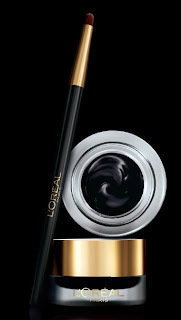 Super duper black, it has highly concentrated pigments in an ultra-creamy formula, and its high precision brush means a thick line in just one sweep. Love that! It is also 24-hour long wear, waterproof and smudge proof, thus ticking all of the boxes that I outlined above.